Writers on Mondays: Corballis and Smaill – how good is that! This event is so timely! This entry was posted in Uncategorized on July 31, 2015 by Paula Green. 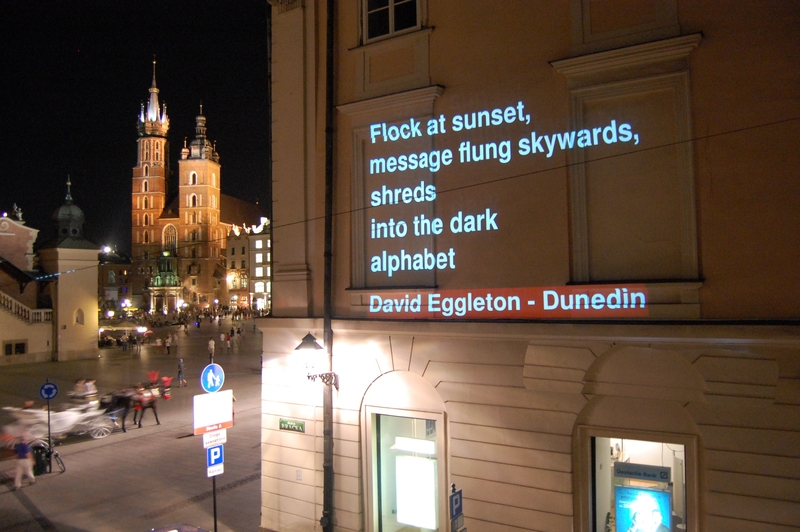 This entry was posted in NZ poetry, NZ poetry event, NZ Poets and tagged David Eggleton on July 31, 2015 by Paula Green. 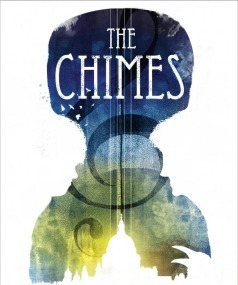 The Chimes was one of my favourite fiction reads in the past year. This book, so beautifully written, so sumptuously layered, so utterly inventive and original, is a must read. To see it on the Man Booker Prize long list is a delight, especially alongside such other extraordinary writers. This entry was posted in Uncategorized and tagged Anna Smaill on July 30, 2015 by Paula Green. 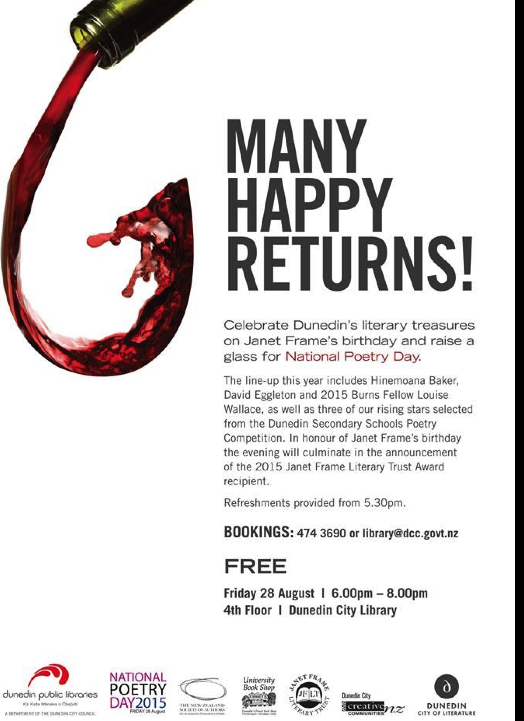 National Poetry Day is also Janet Frame’s birthday, and here in Dunedin there will be a poetry feast at the Library: the winners of the Dunedin Secondary Schools Poetry competition will perform their winning poems along with performances by Landfall editor David Eggleton, 2015 Burns Fellow Louise Wallace and special guest Hinemoana Baker. Poet Diane Brown will MC. 6 – 7.45 pm, Friday 28 August, refreshments from 5.30 pm. 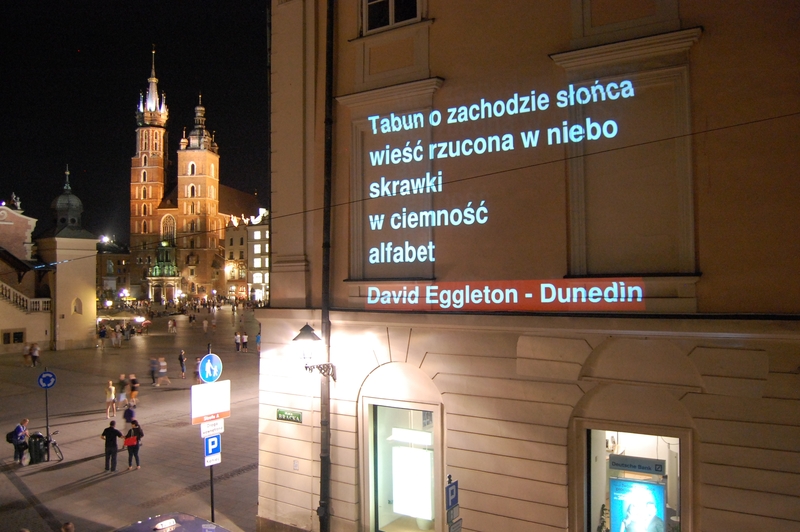 This entry was posted in NZ poetry, NZ poetry book, NZ poetry event, NZ poetry journal, NZ Poetry reading, NZ Poets, Poetry, Poetry Events and tagged David Eggleton, Janet Frame, Lousie wallace, Poetry Day on July 30, 2015 by Paula Green. We invite applications for the Victoria University of Wellington/Creative New Zealand Writer in Residence 2016. Writers in all areas of literary activity, including drama, fiction and poetry, New Zealand art, biography, history, music, society and culture, are eligible to apply. Applicants should be writers of proven merit, and must be either a New Zealand citizen or permanent resident. The Writer will have use of an office at the IIML and while there are no formal duties attached to the position, it is expected that the Writer will take part in the cultural life of the University. The appointment will be for twelve months from 1 February 2016 to 31 January 2017, with a salary of NZ$50,000, and will be made subject to Creative New Zealand funding. This entry was posted in Uncategorized on July 29, 2015 by Paula Green. The LOUNGE readings are a continuing project of the New Zealand Electronic Poetry Centre (nzepc), Auckland University Press and Auckland University English, Drama and Writing Studies, in association with the Staff Common Room Club at Old Government House. This entry was posted in Uncategorized on July 28, 2015 by Paula Green. Come and hear the latest in poetry, in a reading and discussion chaired by poet Cliff Fell. David Beach’s fourth collection, Jerusalem Sonnets, Love, Wellington Zoo, tackles, amongst other things, the inescapable presence of James K. Baxter for nay sonnet writer. Morgan Bach’s debut, Some of Us Eat the Seeds, welcomes a refreshing new voice that is in turns witty and sharp-edged. The international publication of Otherwise, John Dennison’s first collection, heralds a new, vivid and sensual voice in the New Zealand (and UK) poetry scene. 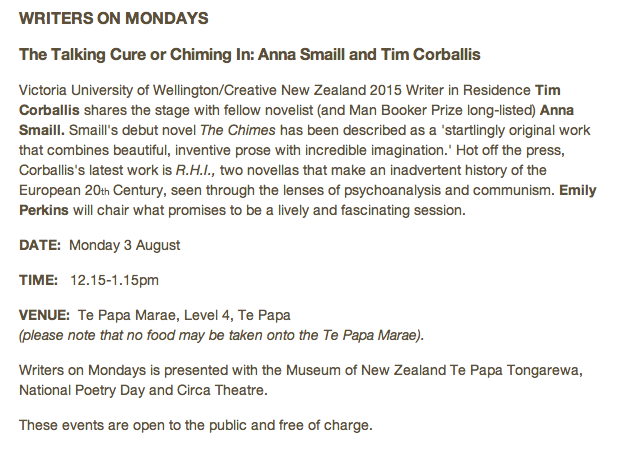 Writers on Mondays is presented with the Museum of New Zealand Te Papa Tongarewa, National Poetry Day and Circa Theatre. This entry was posted in NZ poetry, NZ poetry book, NZ Poetry reading, NZ Poets and tagged David beach, John Dennison, Morgan Bach on July 17, 2015 by Paula Green.